Combination racing MALOSSI for racing driver, with all sizes to choose! 999,00 € 999 tax incl. For all drivers wishing to acquire the combination of the famous Italian brand MALOSSI! Here at home, the combination MALOSSI MHR, size 42 to 58. No need to say much more, MALOSSI was able to do ... here's the description. Malossi chose the sportiest among the combinations to represent its racing colors! A piece of clothing without compromise! Born from the experience gained on racetracks all over the world, this combination is able to guarantee comfort and safety. Suitable for the most demanding riders, thanks to its breakthrough bovine skin and elastic inserts on the back and hips that ensure greater freedom of movement for the arms and shoulders. This combination provides further comfort even in the most extreme conditions. Stretch inside sleeve and leg, coupled with an anti-bacterial and anti-detachable fabric sweat. 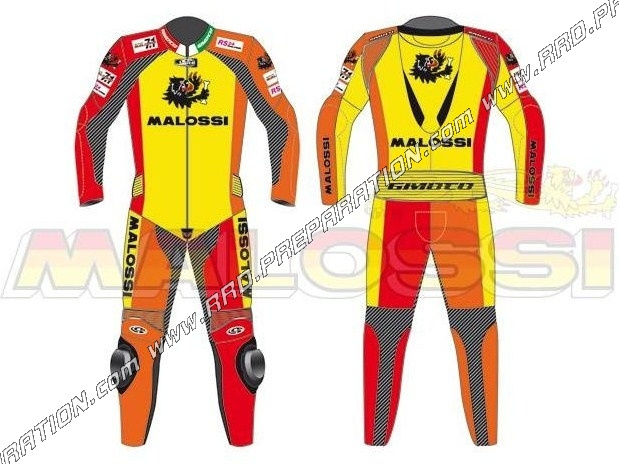 His racing aspect is highlighted by either the aerodynamic hump reveals its sporty taste or by the stretch inserts on the calves, inner thigh, groin and bras.Naturellement hand, protections can not be missed, made ​​of polyurethane and CE approved for greater security, as well as knee pads, essential for long and exciting competitions.